Just when you might have thought that every party from the countries outside England would make their manifesto a shopping list of demands for money to be lavished on them in return for supporting a government, the DUP turn up. Let’s be frank, the key to understanding their approach is that the ‘U’ in DUP stands for ‘Unionist’. So it shouldn’t be a surprise that their manifesto and the launch that accompanied it was about saying that they would support the either mainstream party if the circumstances were right. 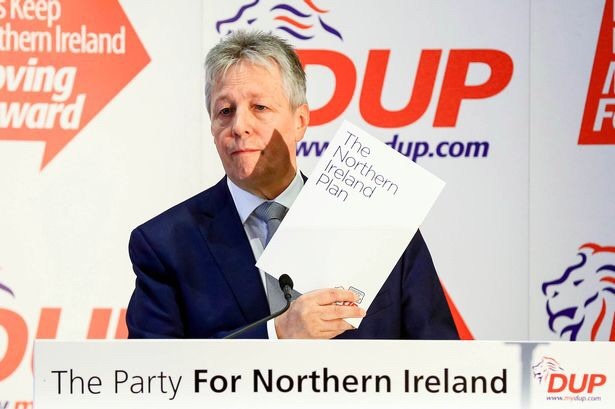 Whilst they were clear that part of their choice would be which delivered the best plan for Northern Ireland, Party leader Peter Robinson was also clear that what they were asking for “couldnt be summarised or dismissed as more money for Northern Ireland”. Instead, the plan would consider what is also in the best interests of the United Kingdom. Gratifyingly, Robinson also said that “whilst we could well play a pivotal role in the next Parliament, we have a sense of perspective about our size and our capacity to dictate policy at a national level.”, which makes a change from the SNP, whose votes represent 2% of the electorate but who presented us with their ransom note yesterday, even trying to dress it up as a plan that is for the benefit for the rest of the UK, since it calls for extra spending on everybody (no link, I assume with the resultant increase in spending that would then have to be granted to Scotland). Nigel Dodds, the Deputy Leader and their Leader in the House of Commons, listed some of the policies they would be interested in. It calls for a budget settlement to enable real increases in health and education spending over five years. On welfare, the DUP wants the abolition of the spare room subsidy also known as the bedroom tax, which aligns it with Labour. However, the Conservatives will be pleased to see that they would like an IN/OUT referendum on the EU and for there to be minimum spending of 2% of GDP on defence. The party also wants air passenger duty abolished because it says it has a disproportionate impact on regions farthest from the south-east of England. It wants guaranteed access from Northern Ireland to London’s hub airports and a feasibility study into a tunnel or enclosed bridge between Northern Ireland and Scotland. Their aims are small, but their impact might not be. Keep your eyes on the DUP in May. « The Joy of Contribsx – Who is Grant Shapps’ biggest fan?